As outlined on our About Us page, Moreton Christian Assembly holds to the importance of the Bible as the final authority on all matters, both for the church and for individuals. A summary of our priorities as a church can be found on the above page, but the following statement of faith lists in detail the theological points which we would adhere to. 1. 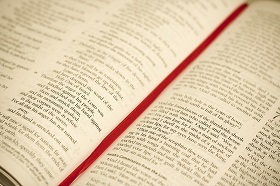 The Holy Scriptures as the divinely inspired Word of God given by the Holy Spirit. These are the supreme authority on matters of faith, practice and conduct as individuals and as a church. 2. One sovereign God eternally existent in three persons: Father, Son and Holy Spirit. 3.The divinity of the Lord Jesus Christ, the virgin birth, His sinless life, His atoning death, His resurrection from the dead, His ascension to the right hand of God, His supremacy in all things, His return in power and glory. 4.The fall of man and the universal sin of the human race, bringing all under the judgement of God. 5. Salvation by repentance and faith in the Lord Jesus Christ alone, Who gave His life as a ransom and sacrifice for sinners. 6. Believer's baptism as an expression of repentance and faith towards God, the burial of the old life and the raising up of the believers to walk in newness of life. 7. The essential work of the Holy Spirit in regeneration, sanctification and the enduement of power in the believer. 8. The Church as the Body of Christ, consisting of individual members who are believers in Christ and under the Headship of The Lord Jesus. If you have a question about any of these points, please do contact us and we will gladly discuss them with you.